Clint Edwards's parenting tips include: 1.You don't have to give your kid a bath all the time, just wipe them down from time to time. 2. If you find a long lost sippy cup, don't open it. Just throw it away, trust me. 3. Getting a sitter so you can go to the store alone is worth every damn penny. 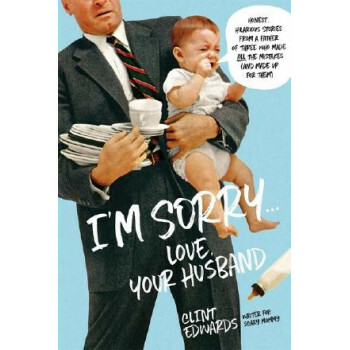 With stinging wit, laugh-out-loud humor and brutal honesty, Clint brings to light what every parent and spouse eventually learns but refuses to say out loud to each other. His essays include "All the Things I Never Should Have Said to My Pregnant Wife," "Just Because I Get Up In the Night Doesn't Mean I Deserve Praise" and "Contrary to My Original Assumption, You Can Have a Favorite Child." His essays will have parents everywhere shaking their heads "yes." Clint's blog, No Idea What I am Doing, has over 144,000 Facebook likes, and he writes for huge outlets like Scary Mommy, Babble, the New York Times and has been featured on Good Morning America. He has three children, aged 2, 7 and 10.